I had the most amazing day of photographic and gastronomic discovery today, so much so that a month's worth of blog posts won't do it justice. During the day I took off to the mountains of western Kyoto with a friend, and in the evening met other friends for an all-you-can eat (all-you-can-drink!) BBQ buffet. A truly wonderful day. I barely had time to glance at some of the photos from the mountains before having to run off to the BBQ, but the colors above caught my eye. It has no post processing except white balance (which I set via a properly-calibrated WhiBal shot), and a slight sliver cropped off the height to get it to fit a widescreen desktop aspect ratio. Otherwise, it's all defaults in Lightroom. It's from a stop at the Gioji Temple (祇王寺) early on before hitting the mountains. The Gioji Temple is one of my favorite “hidden” spots, off the beaten path but still accessible, and just chock full of photogenic wonders. I first posted about it in “An Introduction to Kyoto’s Gioji Temple” almost exactly five years ago. The “nearby photos” link under the photo will bring you to the many posts I've done from this area before, but today was perhaps the first time I visited with my Voigtländer 125mm, so I'm really looking forward to see the results. One of “my” plants ! It’s a meadowsweet, Filipendula, and I wrote about them years ago. There are not many species, but they are quite confusing and confused, especially in European gardens, partly because they appear to seed about and hybridise rather freely, and partly because several look very similar. 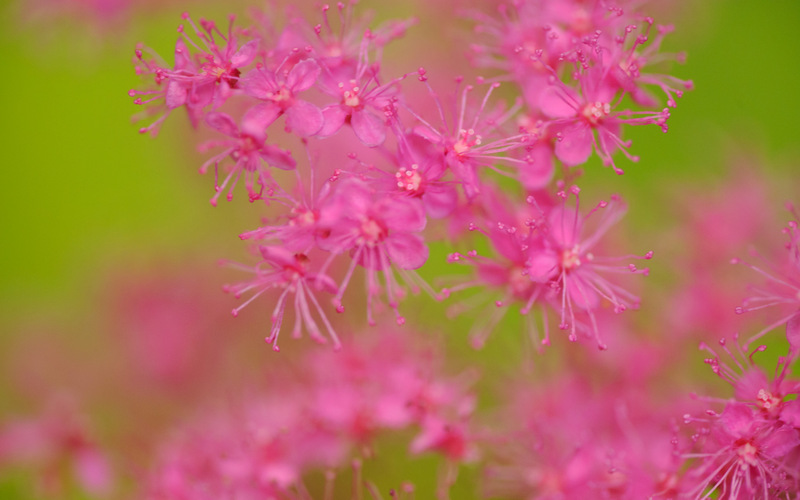 I would guess this may be a cultivar (cultivated variety) called ‘Kahome’, which has very vibrant flowers; but it could also be Filipendula multijuga which is native to Japan, or its probable hybrid F. x purpurea. Sadly, what photographs (transparencies) I had of them succumbed to fungus some time ago, so I should start photographing them again – not flowering yet, here, though. Ideal subjects for the Voigtländer !